There was a time when Asus was considered as the just another name in the smartphone market. Although, the company has got quite a reputation in laptop market but when it comes to smartphones, it was lagging behind. However, things got pretty much better when Asus launched the ZenFone Series. Asus launched three models namely ZenFone 4, ZenFone 5 and ZenFone 6. While the other two models were decent, Asus ZenFone 5 made the headlines. No doubt, Asus ZenFone 5 is a best deal under 10k price segment. It is one of those few devices which offers 2GB RAM at such a low price. The phone is powered by a 2 GHz Intel Dual Core processor and boasts of a 5 inch Full HD display protected by Corning Gorilla Glass. It has got one of the best low light camera in the market and the front camera is just the one you will need for clicking those perfect selfies. But, as the famous saying goes, nothing is perfect, same goes for Asus ZenFone 5. Surely, the phone is a small powerhouse but when it comes to battery, it offers decent performance. We’ll discuss about the Asus ZenFone 5 battery performance here. The phone is equipped with a 2110 mAh Li-Po non removable battery which is not enough for such good specs but still it is able to deliver some decent backup. 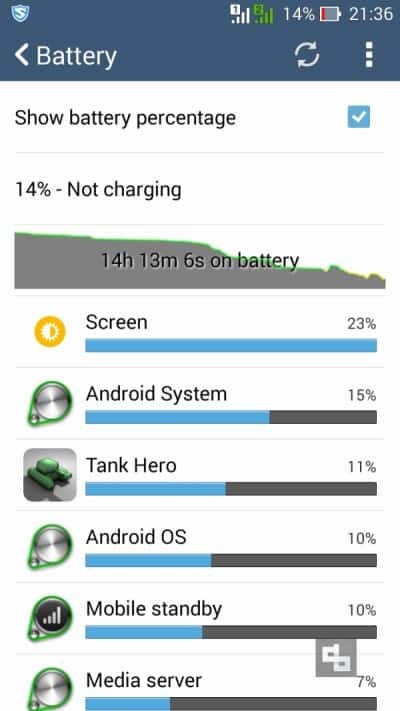 When we had the device, we charged it completely and used it for a day with normal usage. 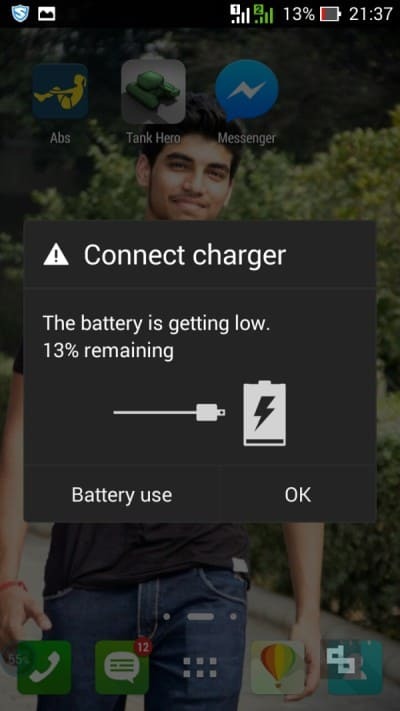 We surfed the internet via 3G connection, played some high quality videos, played heavy games like Asphalt 8 and Dead Trigger 2 and still we were left with 18% of battery at the end of the day. When we reached at 15%, we switched on the ultra-saving mode which actually extends your backup by hours. This mode maximizes the battery life and disconnects the network connection when the display is turned off. This mode can give you 1-2 hours of usage but, messaging apps like WhatsApp, Hike will not work properly. We tested the battery with each and every aspect we can. #MyAsusZenFone 5 lasted for a day with normal usage and can go up to 30-35 hours at standby. Another best part of the battery is that it does not heats up. The major problem with batteries is that they tends to heat up on excessive usage or multitasking. However, there is no such issue with Asus ZenFone 5. We tried heavy gaming, watched full HD videos and there was no sign of any kind of heating. There is no such quick charging feature in Asus ZenFone 5 but, surprisingly the phone charges up quite quickly. We placed both Asus ZenFone 5 and a similar phone of same price range and specs and in the end, Asus ZenFone 5 got fully charged way before the other device. It is expected that the battery will get better after the Android 5.0 update. 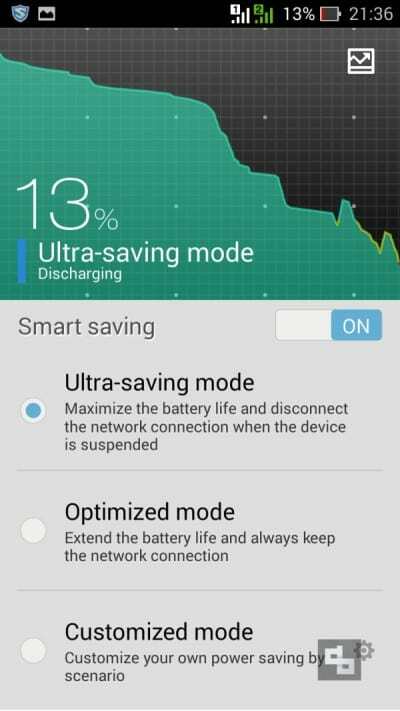 Although, you can conserve your battery by maintaining low brightness, switching off Bluetooth and Wi-Fi when not in use and many more. Although, you will not need a portable charger for Asus Zenfone 5 but, carrying one is not a big deal.